Nancy Price is well-known for her book Sleeping with the Enemy. It was published in 1987 and became a hit movie when it was released in February 1991. Much of the novel is set in a city very much like Cedar Falls with a university very much like UNI. Price, an accomplished poet as well as a novelist, is the daughter of the fourth president of UNI, Malcolm P. Price, the man for whom Price Laboratory School is named. 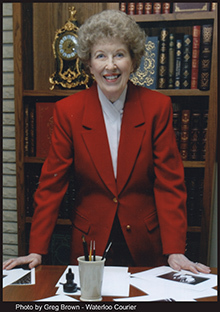 More information about Nancy Price can be located on the Price page of the community Cedar Falls Authors Festival website.